I'm in my hotel in Manhattan. Nice view. Stomach grumbling. Hmmm. Today's Morning Coffee Notes podcast is an interview with my father, Dr Leon Winer, about outlining and other topics. Movie: Uptown, east side, taxi cab. Marc Canter reviews Yahoo 360. Michael Schuermann reviews Yahoo 360. This is what Scoble sees when he clicks on the link to my 360 weblog. He's not a member. You gotta wonder what's the point of a weblog that's not publicly accessible. Postscript from Michael Schuermann. Ross Rader has taken an interest in the RSS textInput element. Michael Gartenberg sent me a 360 invite. So I have an account now. Here be my blog. And a funky song and a picture of Muddy Waters. My mojo is workin! Post a comment if you can. I opened it up to "everyone." Question: Do they have anything like weblogs.com? Do they ping weblogs.com? How do you find out which blogs have been recently updated? Today's song: "I got a gypsy woman givin’ me advice. I got some red-hot tips I have to keep on ice. I got my mojo workin’ but it just won’t work on you. I want to love you so ‘til I don’t know what to do." John Palfrey: "Not too long from now, this blog should have a first-hand account of the Grokster oral argument from the Supreme Court." Michael Gartenberg got a 360 invite. If you've written a 360 review based on a look inside, please send a pointer. And I'll certainly let you all know when and if I get an invite. Jeff Veen got one too. "It reminds me of one of my first trips to the plate in Little League Baseball." Jason Fried says Yahoo always had the mojo, but mojo is not the size, it's what you do with it. It's not the steak, my man, it's the sizzle. It's not the shape, it's how you shake it. Mojo is not about making the buses run on time. 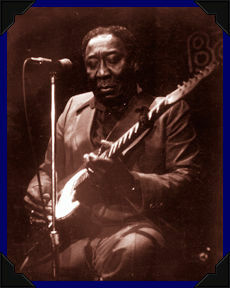 Muddy Waters was not thinking about stock prices when he sang about his mojo workin. 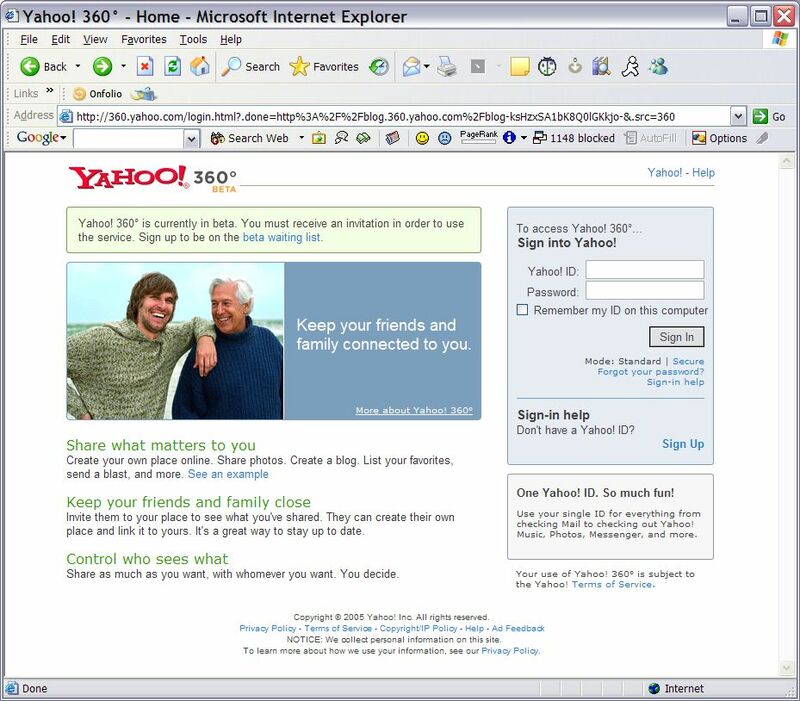 Danny Sullivan: "With the Yahoo 360 social networking site making its semi-public debut, I thought it would be interesting to log back into rival service Orkut, offered by Google, to see what's new. But forget comparing features. What struck me the most was seeing a Google property finally acknowledging RSS as a distribution means." As Danny says, they are properly finally acknowledging RSS. Their feed is plain simple not-funky RSS 2.0.
Review of Yahoo 360 by someone who wasn't invited. Happy third birthday to Paolo's weblog. He has some interesting comments about the apparent change in mood in the last three years. I don't think it's that we've grown up, we'll have fun again. All the projects he mentions are coming back. I dropped the ball, but I had a good excuse. BTW, I should mention that I'm on a diet since 3/18 and losing weight. I don't plan to go on a scale until 4/18, but I feel thinner. I find that the fasting feeling is starting to feel good, kind of like the ache of missing a smoke as I was quitting smoking. Getting in shape for some reason is easier in Florida, the beach is such an inspiration, it feels better to be in better shape. I'm going to lose about 30 pounds and then try to maintain. By writing about this publicly I guess I'm making the next-level commitment. Press release: "Google Inc today announced it has agreed to acquire Urchin Software Corporation, a San Diego, California based web analytics company." Yahoo 360 has launched, invitation only. I'll let you know if I get one. Here's Jeremy Zawodny's 360 weblog. He says to let him know if you were expecting an invite and didn't get one. Can't say I was expecting one. Also can't comment on his blog if you didn't get an invite. They should read my piece about two-tier communities and why they're so not-blog-like. This invite-only insiders stuff is gross. It's a ghost town with 404's all over for people who weren't invited, the exact wrong thing to do on rollout day. The home page of the site is 404. You know it was somewhat cute when Google did the invite-only thing with Gmail, but you could use it to communicate with people who didn't use it. This software is broken for people who aren't 360 users! And Orkut was invite-only too, and it's as dead as can be now. BTW, Yahoo doesn't have its mojo back. What a crock. Their idea of hip is to copy everyone else, badly. Let the Flickr folks, who really do have mojo, show that the elephant can dance, just a little. PS: Now the redesign of Yahoo Groups makes sense. They made it look like 360. And the pictures? Well, 360 shows pictures of people and groups. Now, too bad most of the groups don't actually have pictures. Someone should have thought that through. Did they think 360 was going to be such a raging success that it would make all the groups want to add pictures? This is what happens when big corporations plan out grand strategies, checking their assumptions with focus groups (if they check them at all). Flickr on the other hand, proved every one of its ideas with users. We know which approach leads to usable software. I gave $5000 to the EFF when they started, I think it was in 1990, with the noble goal of protecting freedoms as our technology and culture move online. I think I have supported every cause the EFF has adopted since then, but that's no longer true. I gave this a lot of thought, believe me, and had a long email exchange with Brad Templeton, the chairman of the EFF board of directors, and think they have become as radically polarized as the entertainment industry, and like Hollywood are now working against the interests of those they were meant to serve. The issue appears to be copyright, and it appears that the EFF believes there should be no copyright. My position is that copyright changes with the development of worldwide networking, and all creative people must have some right to the work they create, or else, truly, the incentive to create will disappear. When the entertainment industry makes this claim, there's a glaring hole in their position -- they claim to represent the interests of creative people, but they don't. Their economics make the creative people powerless, they no more represent the interests of creative people than the EFF represents the interests of computer users (who are also creative people). Of course there's enough truth to each argument to make it hard to rebut. But in balance it's true. Instead of being aligned with users, the EFF is aligned with the financial interests of the electronics and software industry. However, if there's any rationality to the justice system in the US, the EFF will prevail in the Grokster case. Why? Because, the act of freely distributing other people's work, without compensation, is something the user is doing, not the software developer. The Grokster defense is good because there are important non-infringing uses of the technology, and without those applications the right to free speech protected by the US Constitution would be violated. That must come first. But copyright is is a good thing, even if it is applied immorally and stupidly by the entertainment industry. We can't have a rational society without it. The EFF can't claim to represent the interests of users if it doesn't stand behind copyright, in some form, and tell us what that is. Copyright is not sacred, and there are times when it must be relaxed, and it must be possible to disclaim copyright, something the Creative Commons helps with, but if we can't rely on the electronic media to render our thoughts and expressions without altering their meaning in transit, what's the point of having electronic media? As I've said here before, the written word is now largely electronic, as is commerce, health care, aviation, and who can disagree that accuracy and attribution matter in those endeavors? The problem with the EFF psosition is that in order to remain consistent, they have had to say that copyright doesn't exist -- if a policy or law restricts what a user can do on the Internet then that is a bad policy or law. The courts can't agree with the EFF. I don't agree with the EFF. Last update: Tuesday, March 29, 2005 at 9:56 PM Eastern.